The Dodgers traded for exiled Cubs closer Carlos Marmol this morning, sending Matt Guerrier to Chicago. Today is a somber day for Cubs' fans. The team DFA'd Marmol a few days ago, but many expected him to simply end up in Iowa because no-one would claim him on waivers. No-one claimed Marmol's massive contract, but the Dodgers traded for him and cash before he had any chance at rebuilding his value in Triple-A. Carlos Marmol was an ineffective starter and low leverage reliever in his rookie season of 2006. He was a converted position player just trying to figure this whole pitching thing out. With the aid of a low-to-mid 90's fastball and one of the best sliders in baseball history, Carlos Marmol was a lightning bolt out of the Cubs bullpen for the next four seasons. 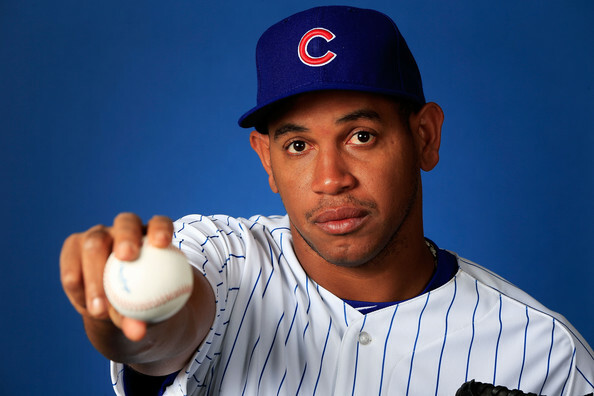 In 2010, his first full season as Cubs closer, Carlos Marmol struck out 42% of the batters he faced. People seem to forget he had four really good season; the lows have been just that low. Carlos Marmol always struggled with control. For a while, it worked to his advantage, as batters couldn't get comfortable in the box. In time, Major League hitters realized they only needed to be comfortable enough to not swing. Cubs fans suffered as Marmol morphed into the wildest pitcher in baseball. Since the start of the 2011 season (over 2.5 seasons), Carlos Marmol walked almost 1 out of every 6 batters he faced, achieving the highest walk rate in the league* at 16.2%. #Dodgers have identified mechanical flaws in Marmol's delivery. Colletti confident they can fix him the way they did League last year. What does Ned Colleti mean when he says that they fixed League? Brandon League is not flawless. I don't want to nitpick League's peripheral stats, just point out one extreme fluctuation. Last year for the Dodgers, Brandon League inherited six runners. None scored. This year, he's inherited five. They've all scored. This is our ridiculous stat of the moment. It's a tiny sample and doesn't mean anything. I'm just finding it odd that Ned Colletti would point at Brandon League as a success story. On the bright side for the Dodgers, Carlos Marmol's diminished strikeout rate since the start of 2011 still ranks in the top 20 among pitchers with at least 100 IP. His 28.9% strikeout rate places him 19th, between Vinnie Pestano and Tyler Clippard, and the Dodgers couldn't have traded Matt Guerrier for anyone like Pestano or Clippard. The Dodgers are the most exciting team in baseball, and it's not just because of Yasiel Puig. With the revenue pouring in, and projected revenues looking even better, the Dodgers have no problem supersaturating their system with high-priced stars and other team's mistakes. They may as well go ahead and get Jonathan Papelbon and Jonathan Lucroy while they're at it.